Three phase transformer connections In three phase system, the three phases can be connected in either star or delta configuration. In case you are not familiar with those configurations, study the following image which explains star and delta configuration. In any of these configurations, there will be a phase difference of 120° between any two phases. 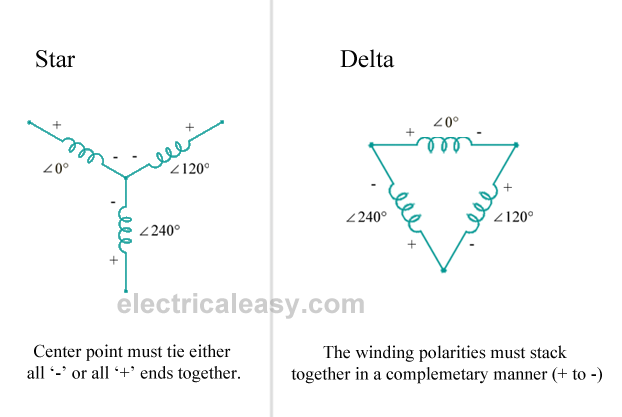 Windings of a three phase transformer can be connected in various configurations as (i) star-star, (ii) delta-delta, (iii) star-delta, (iv) delta-star, (v) open delta and (vi) Scott connection. These configurations are explained below. Star-star connection is generally used for small, high-voltage transformers. Because of star connection, number of required turns/phase is reduced (as phase voltage in star connection is 1/√3 times of line voltage only). Thus, the amount of insulation required is also reduced. 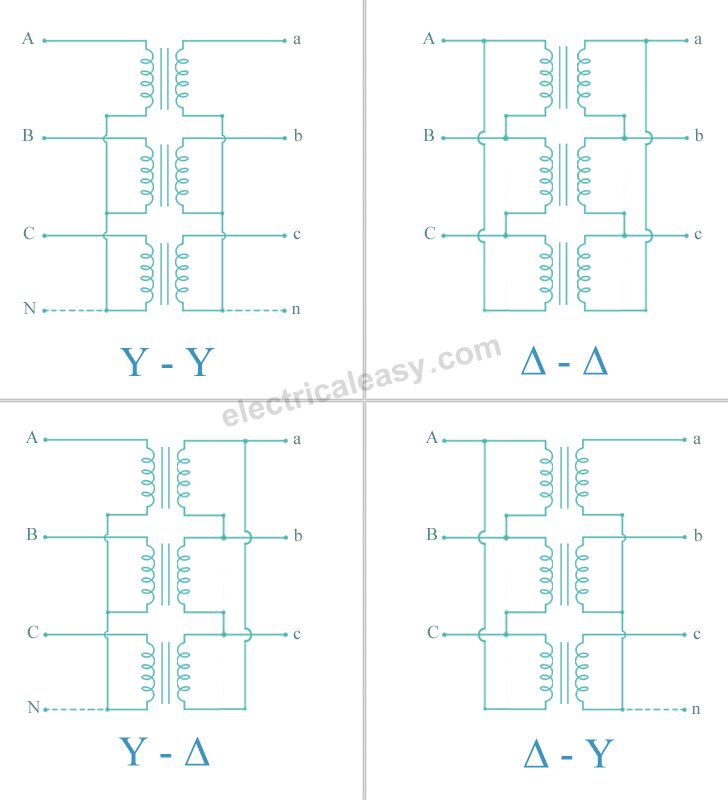 The ratio of line voltages on the primary side and the secondary side is equal to the transformation ratio of the transformers. Line voltages on both sides are in phase with each other. This connection can be used only if the connected load is balanced. This connection is generally used for large, low-voltage transformers. Number of required phase/turns is relatively greater than that for star-star connection. The ratio of line voltages on the primary and the secondary side is equal to the transformation ratio of the transformers. This connection can be used even for unbalanced loading. 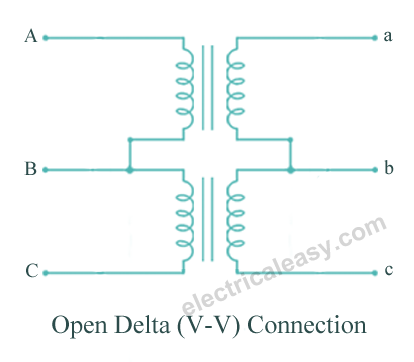 Another advantage of this type of connection is that even if one transformer is disabled, system can continue to operate in open delta connection but with reduced available capacity. The primary winding is star star (Y) connected with grounded neutral and the secondary winding is delta connected. This connection is mainly used in step down transformer at the substation end of the transmission line. The ratio of secondary to primary line voltage is 1/√3 times the transformation ratio. There is 30° shift between the primary and secondary line voltages. The primary winding is connected in delta and the secondary winding is connected in star with neutral grounded. Thus it can be used to provide 3-phase 4-wire service. This type of connection is mainly used in step-up transformer at the beginning of transmission line. The ratio of secodary to primary line voltage is √3 times the transformation ratio. Above transformer connection configurations are shown in the following figure. Two transformers are used and primary and secondary connections are made as shown in the figure below. Open delta connection can be used when one of the transformers in Δ-Δ bank is disabled and the service is to be continued until the faulty transformer is repaired or replaced. It can also be used for small three phase loads where installation of full three transformer bank is un-necessary. The total load carrying capacity of open delta connection is 57.7% than that would be for delta-delta connection. Two transformers are used in this type of connection. One of the transformers has centre taps on both primary and secondary windings (which is called as main transformer). The other transormer is called as teaser transformer. 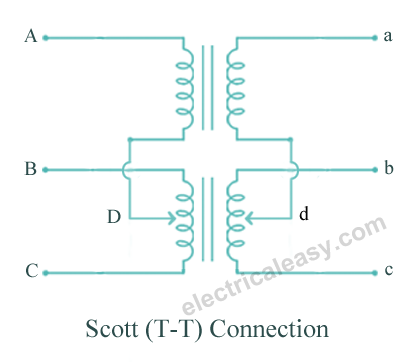 Scott connection can also be used for three phase to two phase conversion. The connection is made as shown in the figure below.